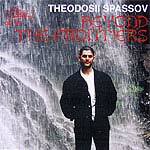 The CD Beyond The Frontiers includes 16 songs and features film music composed and in most of the recordings performed by Theodosii Spassov, the capacities of whose kaval are indeed beyond the frontier. At the recordings took part: Theodosii Spassov - various kavals, I.Iliev – clarinet, B.Dinev – tupan, R.Toskov – piano, G.Donchev – bass, Female Folk Choir, Zornitsa Ensemble, Jazz Trio, Simfonieta Orchestra and others. 6 Bojoura (to Boyka) 4'38"
8 The Road to Mugla 2'06"
14 Zlatolist (to Daniele and Vincent) 1'19"